Heat oven to 375°F (350°F if using a dark or non-stick tin). Line 2 muffin tins with paper baking cups. In a large bowl, beat cake mix, water, oil, canned pumpkin puree and eggs on low speed for 30 seconds, then increase speed to medium and beat for 2 minutes, scraping the sides of the bowl occasionally. Divide the batter among the baking cups, filling them about 2/3 of the way full (about 3 tablespoons per baking cup). Bake cupcakes 15 minutes until a toothpick inserted in the center comes out clean. Cool 5 minutes in muffin tin, then transfer to a cooling rack to cool completely. 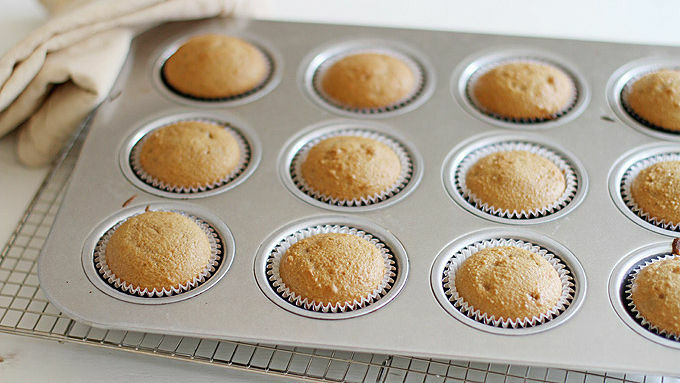 Carefully hollow out the centers of each fully cooled cupcake. Fill with a tablespoon or so of dulce de leche. Beat all of the frosting ingredients together until combined and smooth. Frost tops of cupcakes and sprinkle with chopped pecans, if desired. Substitute thick caramel sauce for the dulce de leche, if desired. You can't beat these cupcakes for the perfect fall dessert or party treat. 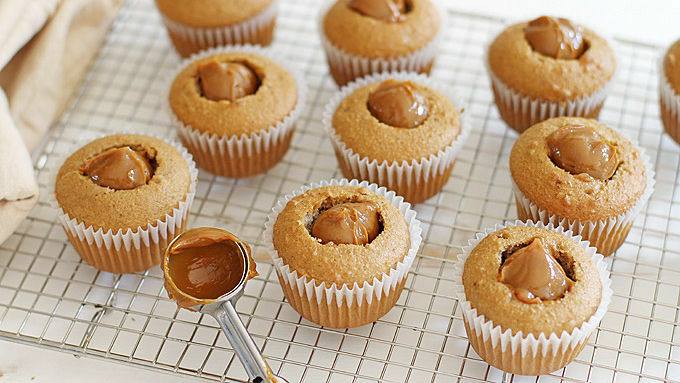 When pumpkin spice and dulce de leche meet, it’s pretty much a match made in dessert heaven. 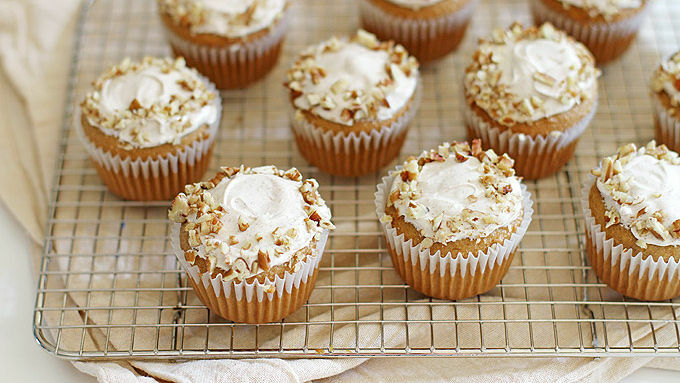 These Caramel Cream-Filled Pumpkin Spice Cupcakes are just that, too – heavenly, and oh-so-delicious. Topped with a cinnamon-brown sugar cream cheese frosting, they’re a decadent fall treat you won’t want to wait longer than, like, the end of this post to make. To dig out the middles of the cupcakes, I have this fancy-yet-totally-ridiculous cupcake hollower-outer thingy I got from the craft store, but feel free to use a spoon, a melon baller or even a small ice cream scoop. Substitute thick caramel sauce for the dulce de leche, if desired. Good gracious, do you see what I see? 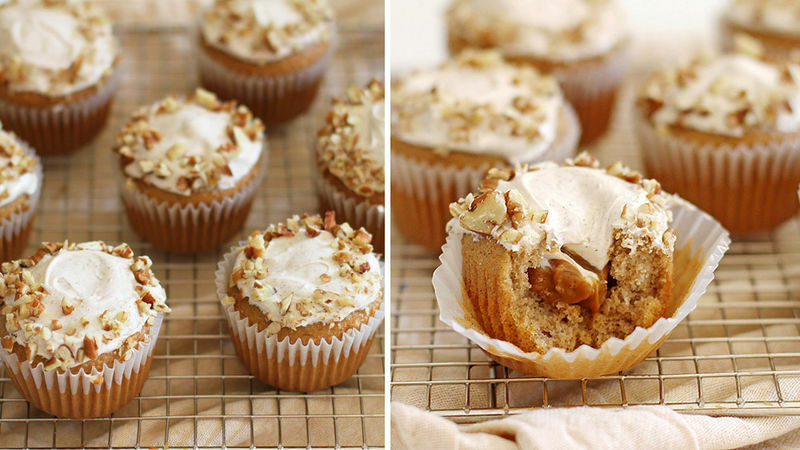 Glorious pumpkin spiced, dulce de leche-filled cupcake yumminess, that’s what that is. If this recipe doesn’t immediately get you in the fall baking mood, well then, I’ll have to eat all the cupcakes myself. Darn.